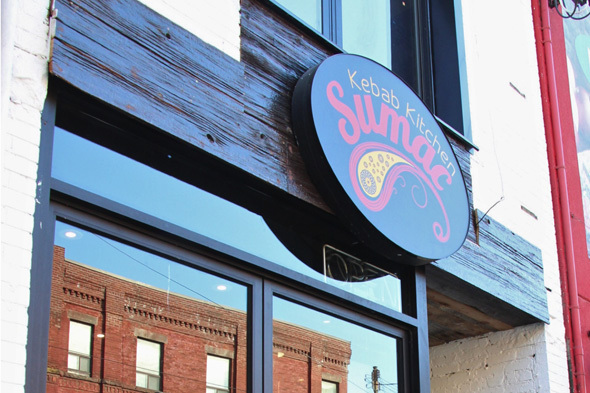 Sumac Kebab Kitchen recently opened next to OCAD at Dundas and McCaul, specializing in - you guessed it - kebabs. The Middle Eastern restaurant, named after the lemony powdered spice ground from the sumac plant, pairs succulent kebabs with a mix of salads, yogurts, rices and stews, a cozy environment and friendly staff. Sumac offers a variety of chicken and beef kebab options, plus shrimp, served two ways: on a plate with two of salad, rice or yogurt ($10-14) or in a sandwich ($6-8) sans sides. The beef kebab comes recommended at the counter, with good reason, as the meat is hearty but tender, juicy with big beef flavour; it comes nestled next to fragrant jasmine rice and a meaty roasted tomato. 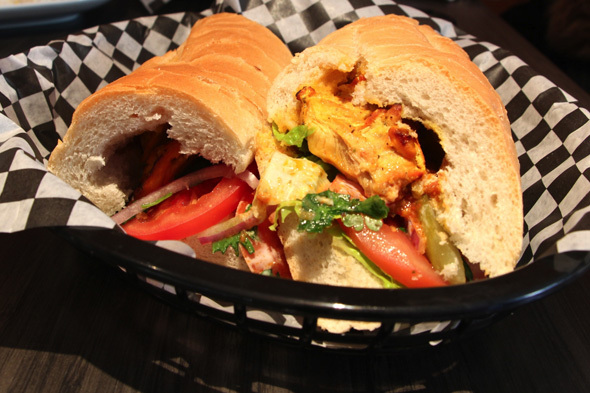 The chicken mix sandwich, which comes in white or dark meat, is a little more exciting, middle of the road soft bun notwithstanding, topped with tomato, pickle, onions, mayo and parsley. Once again the meat is tender, brimming with spice and a faint but pleasant char, and a deal at seven bucks. Better than either of these, though, and in fact truly exceptional, is the eggplant stew ($9), served with rice and yogurt (friendly staff are eager to please and, given our food critic-sized portions, we end up with a smaller side of stew served with pita). 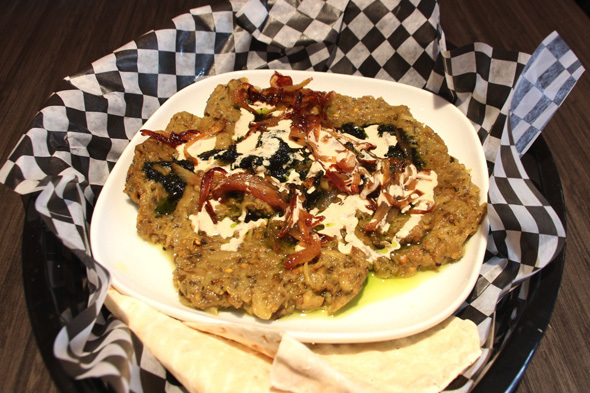 It's the kind of dish you would serve an unruly child to trick them into eating their vegetables - meaty eggplant cooked down to a thick, dip-like consistency, then topped with yogurt and herb tapenade and studded with caramelized onion, which lend depth of feel, sweetness and flavour all at once. This dish is worth a visit alone, one of the best things I've eaten so far this year. 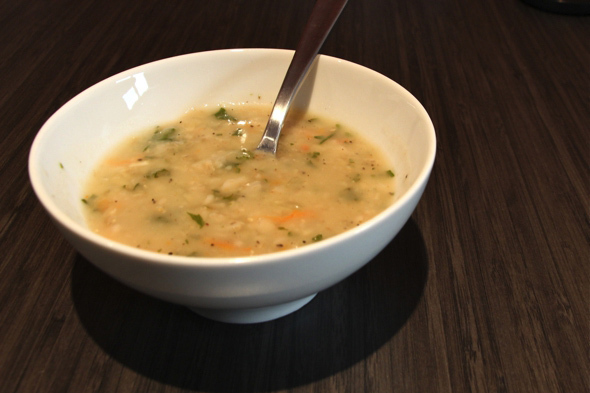 The soup of the day ($3) when we visit is a milky barley, not dissimilar to a rice pudding or grits, flecked with bits of parsley and carrot. A hefty vinegary aftertaste may give some pause, but for three dollars it serves as a welcoming start or accompaniment to the meal. 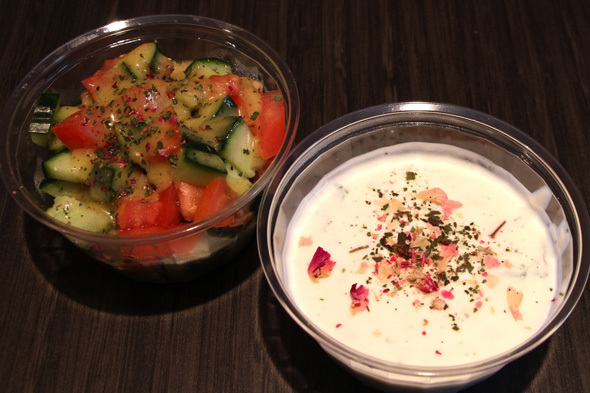 A variety yogurts on offer as sides ($3) will undoubtedly be familiar to anyone who has tried raita, with flavours ranging from cucumber to shallot to eggplant. Side salads include the namesake sumac ($6), unfortunately unavailable on the day of our visit due to a basil shortage, garden and shirazi ($4 each). We try the shirazi, which ends up being a slight disappointment, a mix of cucumber, tomato, onion, mint and lemon with a herby aftertaste that nevertheless doesn't quite connect, a little too plain Jane perhaps as compared to the other offerings. Seating is limited downstairs at Sumac, though a narrow staircase leads to additional space on the second floor. Whether eating in or taking out though you won't go too wrong, as Sumac adds some pleasant spice to life.